The Mud Mountain Dam was completed in 1948 by the U.S. Army Corps of Engineers. At the time, it was the highest rock and earth-filled dam in the world. 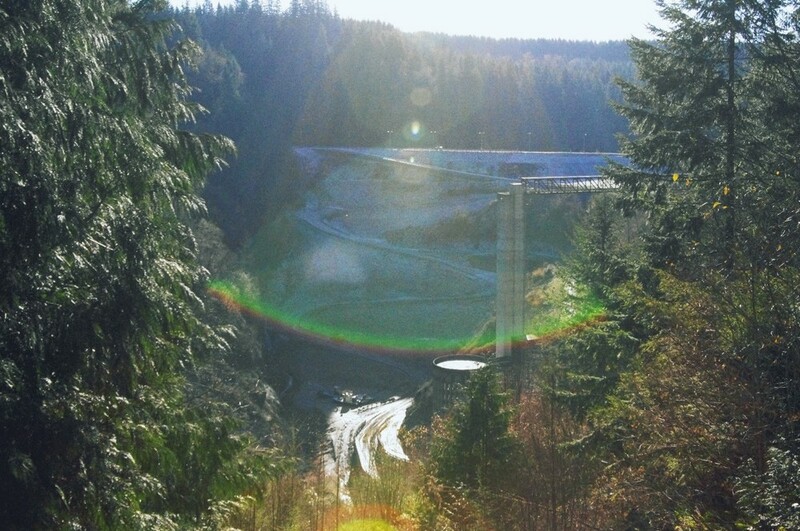 It’s used for flood control in the lower White and Puyallup River valleys. The 4.2 mile round trip Rim Trail was added in 1980. Taking an average of two hours to complete it’s a pretty easy hike. To access the trailhead you’ll find a small dirt parking lot on your left before you reach the gate for the park. We do not recommend parking here for reasons mentioned below. If the gate to the park is open, and it’s not getting late, park inside there. Just make sure to read the hours and plan accordingly so your vehicle doesn’t get locked in overnight. Once you start the hike you have the option of making a right or a left. If you go right it will take you towards the park and the dam overlook platform. The view of the dam from here is ok. There is a short Vista Trail which starts out on the other side of the platform. The gate for it was closed during our visit so we didn’t do it, but it’s only 0.3 miles in length and from what others have written, it sounds like there’s a better view of the dam from it. After you’re done exploring this area return back the way you came and head straight down the trail past the dirt parking lot to continue on. The majority of this trail is right along the edge of the rim with steep drop offs that are up to 400 feet high. Use caution and keep children and dogs close to you. There are wooden fence railings along a portion of the trail, but the cliffs are still present in many locations without the railings. It was a crisp 34 degrees when we climbed out of the Jeep. The trail was layered with frost laden leaves that crunched underfoot as we made our way forward. During our visit there were some downed trees, one was large enough that we did have to climb over it, most were small enough to simply step over. After a while the trail will reach an old dirt road. There are no signs here indicating which way to go. Make a right and quickly after you’ll see a trail marker on the left to continue onward. Most of the trail up to this point was flat, from here it begins to descend steeply for about 100–150 feet. It became noticeably more quiet at this point. The far off sounds of traffic were now gone. Just the twittering of birds and skittering sounds of the occasional squirrel were heard here. Now you’re back to mostly level trail. You’ll come across a handful of boardwalks and dual wood planks for crossing over some marshy areas. Some of these were a bit slippery so take your time. The trail now leads back out to a dirt road again (we’re guessing it’s the same road as before). If you look to the left you’ll see a single stall vaulted toilet shack. Use it if you need to, it was stocked with toilet paper. Right behind the shack you’ll see some more planks of wood. The trail continues to your left from here. While making your way through this portion you’ll notice railings along your right. Again, it is highly recommended that you stay on the trail. The view of the river below is pretty much non-existent during most of this trip but attempting to get closer to the edge can be dangerous. There was a large tree that had recently came down and destroyed some of this railing. The tree was cut here and did not block the trail at all. Your next obstacle is a hill going up roughly the same amount you previously came down. It’s steep but easily ascended. After reaching the top the trail continues to the right, you climb just a little bit more, then it levels out again. You’ll reach a bench soon. Good spot for a break if needed and looking out across the river you’ll notice a waterfall. Continue on the trail for just a little longer and you come to an open area with trail signs indicating the now completed Rim Trail and River Trail. While here we noticed some cans being held by sticks which looked like they were used for target practice. We heard a lot of gun fire during the hike. None of it sounded too close by. We decided to take the River Trail, which ended up being just a road. It descends steeply and bends around to the left. You eventually come across an open area which looked to be a storage place for downed trees and some type of large logged shaped metal things. Walk a little further before you come to a view of the river. The total trip down this “River Trail” was a little over 1/2 mile. At the bottom the road was very muddy and the cliffs to the left looked to have either fallen in a landslide or this area was flooded recently. The trees and leaves were all covered in mud. We chose to turn around at this point and head back. We encountered another hiker on our return journey, he asked if there was anything interesting as he gestured to the direction we had come from. We told him about the waterfall and that the river lay a bit further on, but no real scenic overlooks. We all agreed it was still just nice to get outdoors and get some exercise. We also came upon a gentleman and his daughter and dog. The daughter was atop a horse. We were on the portion of the trail that was marshy with wooden boardwalks. The horse and rider didn’t make it far before thinking better of it and turning to go around. While not the most entertaining of trails we’ve been on, it’s still worth checking out. The views of the dam at the overlook platform are ok. On the trail though, no views of the dam and very few views of the river below. For exercise purposes this trail was pretty good. It took us about 2.5 hours to complete everything and we traveled a distance of 5.5 miles. This is an easy day hike with fresh air and a mostly peaceful environment. 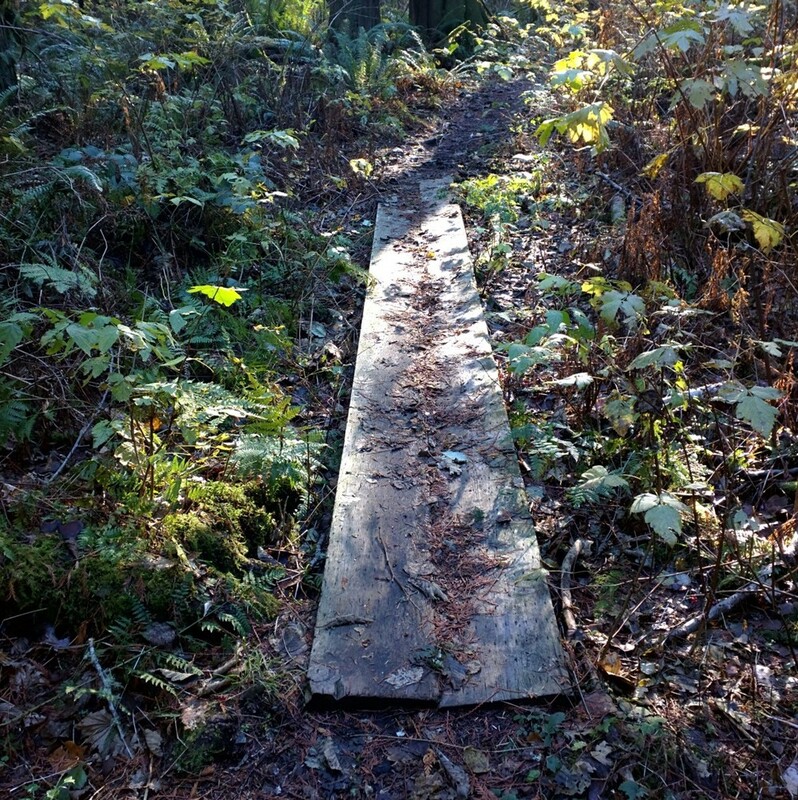 The trail is hiked often enough to keep it cleared of blocking debris and has few hazards. One thing worth mentioning is that the parking lot, and a lot of the areas along the road in, were a bit sketchy. Upon returning to the lot we noticed someone who appeared to be looking into another vehicle parked near us. We thought this was his vehicle, but then he quickly walked out to the street and got in another vehicle and drove off. There were a handful of other vehicles parked along various portions of the road with the drivers just sitting in them. On a previous visit we also saw a large group of what looked like teenagers in the parking lot just hanging out and drinking. If you do decided to hike we suggest coming early and parking inside the park boundaries. There was a park host camped here during our last visit and everything was on the up and up in there. Plan well, pack well, hit the trail!